PMEL's Dr. Billy Kessler is currently participating in NASA’s Salinity Processes in the Upper Ocean Regional Study (SPURS) in the Atlantic Ocean. 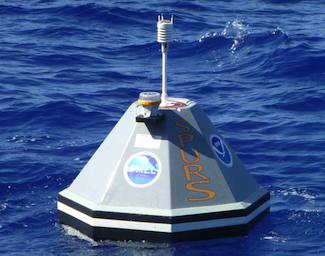 SPURS addresses the role of the ocean in the global water cycle. PMEL engineers have contributed to this study by developing and deploying two Prawler (Profiler + Crawler) equipped moorings. The Prawler device, which is attached to the mooring line, uses wave-powered energy to crawl up the line, taking temperature/salinity measurements along the way. You can read more about how the Prawler works and view the data in near real time on PMEL’s Engineering Development Division website.